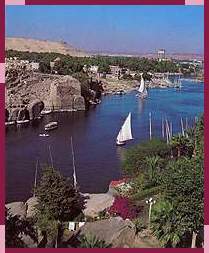 Elephantine Island is one of the strongest forts along Egypt's southern borders, separating the Nile into two channels opposite Aswan. the Temple of Khnum, originally erected during the Old Kingdom, a Graeco-Roman Necropolis and the Temple of Satet, built by Queen Hatshepsut. Practically the whole of Plantation Island which lies mid-stream, near Elephantine Island, is a botanical garden, filled with exotic plants and trees imported from all over the world. It is the perfect place tospend a lazy afternoon in the shade. 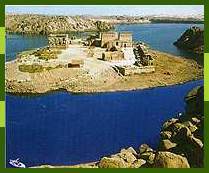 This island now houses the Temple and relics of Philae Island that was submerged by the waters of the High Dam. The Temple of Philae was dismantled and re-assembled on this island which lies about 500 metres from the original Philae Island. A sound and light spectacle is performed in various languages.